Start a "time"-honored tradition of your own. The Apollo square top desk clock is suspended in beveled transparent panels with striking silver metal accents. Elegant Roman numerals, second hand, and deluxe quartz movement complete its display. A handsome decoration for any setting, it makes an excellent gift or award. 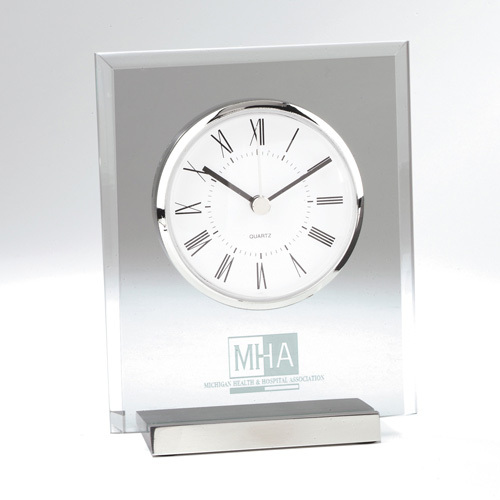 Clock measure 6" x 4 3/4" x 2" and may be purchased blank or customized with your company logo. 6 " x 4 3/4 " x 2 "
Bulk / 45 lbs. lbs / 54 pcs. / 29" x 17" x 20"box.